Typha angustata Bory & Chaub. Typha angustata L. -> Typha angustifolia L.
Typha angustifolia Aubl. -> Typha domingensis Pers. Typha angustifolia Decne. -> ? Typha angustifolia Eckl. & Zeyh.ex Rohrb. -> Typha capensis (Rohrb.) N.E. Br. Typha angustifolia Hook. f. -> ? Typha angustifolia Hook. f. subsp. muelleri (Rohrb.) Graebn. -> Typha muelleri Rohrb. Typha angustifolia L. subsp. australis (Schum. & Thonn.) Graebn. Typha angustifolia L. var. angustata (Bory & Chaub.) Jord. -> Typha angustata Bory & Chaub. Typha angustifolia L. var. domingensis (Pers.) Hemsl. -> Typha domingensis Pers. Typha angustifolia L. var. spathacea Borbás -> Typha angustifolia L.
Typha angustifolia Sibth. & Sm. -> Typha angustata Bory & Chaub. Typha australis Schum. & Thonn. -> Typha angustifolia L. subsp. australis (Schum. & Thonn.) Graebn. Typha capensis (Rohrb.) N. E. Br. Typha elephantina Schimp. ex Rohrb. -> Typha elephantina Roxb. Typha elephantina Thw. -> Typha elephantina Roxb. Typha elongata Pauquy -> Typha latifolia L.
Typha gracilis Raf. -> Typha latifolia L.
Typha gracilis Reichb. -> Typha angustifolia L.
Typha gracilis Schur -> Typha angustata Bory & Chaub. Typha gracilis Schur -> Typha angustifolia L.
Typha javanica Schnizlein ex Rohrbach -> Typha angustifolia L.
Typha juncifolia Celak. -> Typha laxmannii Lepech. Typha latifolia L. subsp. capensis (L.) Rohrb. -> Typha capensis (Rohrb.) N. E. Br. Typha latifolia L. subsp. laxmanii (Lepechin) Douin -> Typha laxmannii Lepech. Typha latifolia L. subsp. shuttleworthii (Koch & Sonder) Stojan. & Stef. -> Typha shuttleworthii Koch & Sond. Typha laxmannii Jord. var. davidiana (Kronf.) C. F. Fang -> Typha davidiana (Kronf.) Hand.-Mazz. Typha major Curt. -> Typha latifolia L.
Typha martini Ait. -> Typha laxmannii Lepech. Typha martini Jord. var. davidiana Kronf. -> Typha davidiana (Kronf.) Hand.-Mazz. Typha media DC., nom. illeg. -> Typha latifolia L.
Typha minima Funck ex Hoppe subsp. laxmanii (Lepechin) Nyman -> Typha laxmannii Lepech. Typha salgirica A. Krasnova -> Typha angustata Bory & Chaub. Typha shuttleworthii Koch & Sond. Typha stenophylla Fisch. & Mey. -> Typha laxmannii Lepech. Typha stenophylla Haussk.ex Rohrb. -> Typha haussknechtii Rohrb. Typha tenuifolia Kunth -> Typha domingensis Pers. Typha transsilvanica Schur -> Typha shuttleworthii Koch & Sond. Typha zerovii Klok. fil & A. Krasnova -> Typha laxmannii Lepech. CHINESE : Chang bao xiang pu. Considered as a synonym of T. domingensis by Michel Kerguélen (INRA - France). ARABIC : Bardî, Bût, Hhafâ'. CHINESE : Shui zhu, 水燭 (Hong Kong). CZECH : Orobincem uzkolistym, Orobinec úzkolisty (y with aigu accent). ENGLISH : Cattail (USA), Cumbungi (Aboriginal - Aust. ), Lesser bulrush, Lesser reed-mace, Narrow-leaf cattail, Narrow-leaved cat-tail, Reed-mace, Small bulrush. FRENCH : Massette à feuilles étroites, Massette des étangs, Quenouilles. GERMAN : Schmalblaettriger Rohrkolben, Schmaler Rohrkolben. ITALIAN : Lisca a foglie strette, Mazza sorda, Stiancia minore, Tifa a foglie strette. NORWEGIAN : Smalbladet dunkjevle, Smalt dunkjevle. SPANISH : Anea, Espadaña, Espadaña común, Espadaña estrecha, Espadona, Junco de la pasion, Macio de hoja estrecha, Mazio, Paja de sillas. VIETNAMESE : , , . Photographs by Jan Wesenberg in Norwegia. Photograph of foliage in Italy. Photograph of female flowers in Switzerland. SYNONYM(S) : Typha australis Schum. & Thonn. CHINESE : Ao da li ya shui zhu, Ao zhou shui zhu. ENGLISH : Cumbungi (Aboriginal - Aust.). SPANISH : Enea, Espadaña, Boga de fulla estreta (Catalan), Balca de fulla estreta (Catalan). Photoghraph by Laboratori de Botànica, Dept. de Biologia, Universitat de les Illes Balears. Palma de Mallorca. (Spain). SYNONYM(S) : Typha angustifolia Eckl. & Zeyh. ex Rohrb., Typha latifolia L. subsp. capensis (L.) Rohrb. ENGLISH : Cape bullrush, Common bullrush (South Africa), Cossack asparagus. FRENCH : Massette du Cap. 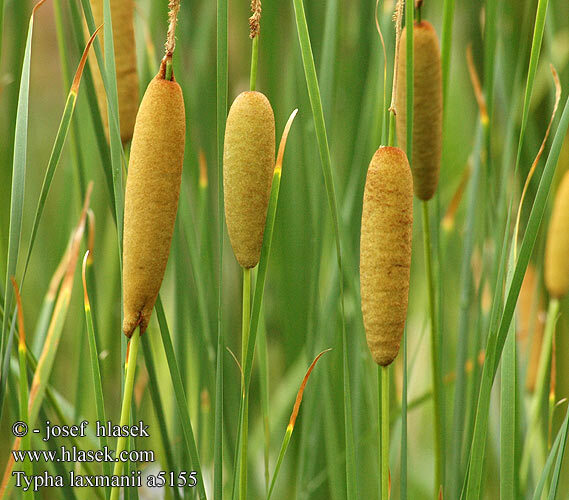 SYNONYM(S) : Typha laxmannii Jord. var. davidiana (Kronf.) C.F.Fang, Typha martini Jord. var. davidiana. Kronf. ENGLISH : Narrow-leaved cumbungi (Aust. ), Cumbungi (Aboriginal - Aust. ), Southern cattail (USA), Tall cattail. SPANISH : Espadaña, Espadaña de México, Totora. Considered as a synonym of Typha angustata Bory & Chaub. by Michel Kerguélen (INRA - France), and as a synonym of Typha angustifolia L. subsp. australis by others (University of Jerusalem for example). Australian Aboriginal names suggest that the second option could be correct. SYNONYM(S) : Typha maresii Batt. ENGLISH : Elephant grass, Elephant's grass. HINDI : Biiraa, Boraa, Sarapata. Typha gracilis Rafin. -> Typha latifolia L.
SYNONYM(S) : Typha stenophylla Haussk.ex Rohrb. SYNONYM(S) : Typha elongata Pauquy, Typha gracilis Rafin., Typha major Curt., Typha media DC., nom. illeg. ARABIC : Bardî, Bût, Dâdî, Tîfâ. CHINESE : Kuan ye xiang pu. CZECH : Orobincem sirolistym, Orobinec sirolisty (s with inverted circumflex accent & y with aigu accent). ENGLISH : Bulrush, Broadleaf cattail (USA), Broad-leaved cat-tail, Cattail (USA), Cat's tail, Common cat-tail, Great reed-mace, Marsh pestle. FRENCH : Jonc de la passion, Massette à grosses feuilles, Massette à larges feuilles, Roseau des étangs. GERMAN : Breitblättriger Rohrkolben, Breiter Rohrkolben. ITALIAN : Bastone acquatico, Candela, Lisca a foglie larghe, Lisca maggiore, Mazza d'acqua, Mazza sorda, Papea maggiore, Sala grande, Sordoni, Stiancia d'acqua, Tifa. JAPANESE : Gama, Nemurokou hone. NORWEGIAN : Bred dunkjevle, Bredt dunkjevle, Dunkjevle. PORTUGUESE : Murrâo dos fogueteiros, Tabua larga. RUSSIAN : Rogoz gratsioznyi (as T. gracilis Raf. ), Rogoz kamysh, Rogoz shirokolistnyi. SPANISH : Aceña, Enea, Espadaina, Espadaña ancha, Espadaña común, Junco de estretas, Junco de la pasión, Macío, Tule espidilla. TURKISH : Büyük su kam1sh1. CZECH : Orobinec sítinovity (y with acute accent). SYNONYM(S) : Rohrbachia minima (Funck ex Hoppe) Mavrodiev, Typha pallida Pobed. CHINESE : Xiao xiang pu. CZECH : Orobinec nejmensí (s with inverted circumflex accent ). SYNONYM(S) : Typha gracilis Jord. RUSSIAN : Rogoz gratsioznyi (as T. gracilis). SYNONYM(S) : Typha minor Sm. SYNONYM(S) : Typha angustifolia Hook.f. subsp. muelleri (Rohrb.) Graebn. ENGLISH : Edible-rooted bullrush, Edible-rooted cat's tail, Raupo (Maori - New Zealand), Wonga (Aboriginal - Aust.). SYNONYM(S) : Typha latifolia L. var. orientalis (C. Presl) Rohrb., Typha orientalis C. Presl. var. brunnea Skvortsov, Typha shuttleworthii Koch & Sond. subsp. orientalis (C. Presl) Graebn. ENGLISH : Broad-leaved cumbungi (Aust. ), Cumbungi (Aboriginal - Aust.). CHINESE : Dong fang xiang pu. FRENCH : Massette de Shuttleworth. Hanelt Peter et al.,2001, Mansfeld's Encyclopedia of Agricultural and Hoerticultural Crops, Vol. 5. Institute of Plant Genetics and Crop Plant Research (Editors), First English Edition, Springer. Kerguélen Michel, 2002, Index Synonymique de la Flore de France. INRA. Onego.com, 2003, Botanical Encyclopedia. Typha. < http://home.onego.ru/~otsoppe/enciclop/voda/typha.html >. Photographs. USDA, ARS, 2002, National Genetic Resources Program. Germplasm Resources Information Network - (GRIN). [Online Database] National Germplasm Resources Laboratory, Beltsville, Maryland. Available: www.ars-grin.gov/cgi-bin/npgs/html/taxdump.pl?typha (02 May 2003). W3TROPICOS, 2003, Missouri Botanical Garden's VAST (VAScular Tropicos) Nomenclatural Database & Associated Authority Files. < http://mobot.mobot.org/W3T/Search/vast.html >. Contributors to this page (Personal communication) : Pankaj Oudia.